patterns > Barrett Wool Co. 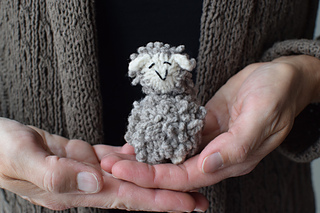 I am excited to be offering 7 exclusive video tutorials that take you through each step of the Three Wee Sheep project. The links are included in the pattern and are only available for pattern and kit purchasers. It’s like getting a workshop from me along with your pattern. 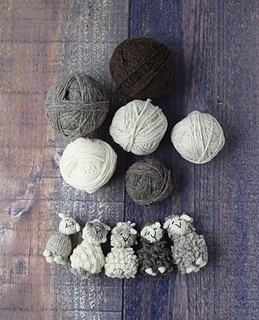 Three Wee Sheep is the perfect project for any sheep-loving knitter to keep or gift. 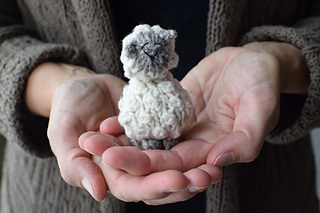 The sheep are tiny and can be set on a desk at work, put in the pocket of a child, or hung as an ornament as a sweet decoration. The loop stitches will keep your fingers in great shape, I promise. The loop stitches are only for a few rounds on a small number of stitches so don’t be intimidated. The construction is fun and seamless. The sheep are worked from the bottom up in one piece. The feet and ears are picked up and knit right on to finish things off. Be sure to read through the Stitch Guide before you cast on. Video tutorials links for each step are on page 4 of the pattern. Barrett Wool Co. Wisconsin Woolen Spun Worsted Weight (100% American Wool; 250 yards/100 grams), small amounts needed. Used in the samples are the colors: Oats, Hawthorn, Birch, Rain Shower, Stone and Quaker Gray. The knit samples weigh about 8 grams stuffed. Note: When doing loop stitches it is important to have a yarn that isn’t slick or slippery. I recommend 100% wool and woolen spun works the best. US size 5 or 3.75mm, set of four double-pointed needles or size to obtain gauge.